How to get a China Visa in Hong Kong Easily!! Getting a China Visa is easy in Hong Kong! It came to my attention recently that a few travellers have had problems and issues getting visas for China. Everyone wants to visit the world’s most populated country so I’m here with my latest visa advice for China!! 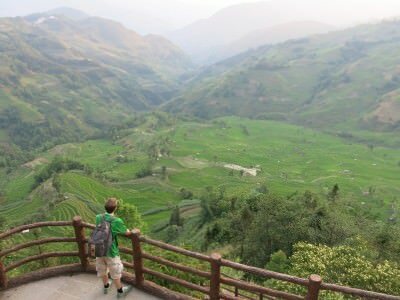 I’m heading to China again soon for my 16th visit and I want to explain an easy and simple way for you travellers to get your China Visa – it’s easy! All you need to do is … get yourself to HONG KONG! Admriring the rice terraces at Yuanyang pre sunset in China’s Yunnan Province. In terms of defining a country, as far as I’m concerned Hong Kong is one. It has it’s own currency, flag, visa regulations and national football team. It was also British for a while, and that ended back in 1997. These days, lots of nationalities can get to Hong Kong without a Visa. You will get a stamp on arrival at the airport. If you arrive on a UK passport you can stay for 180 days no problem! A lot of nationalities also get a 90 day entry stamp – check with your embassy. Hong Kong borders China, and there are about 5-6 different border entry points. I have passed through all of them in the last few years. But before you get there you will need a valid China Visa, unless you are Chinese or a nationality that doesn’t require one (possibly Cuba or other ‘Communist’ countries – check with your embassy). There are literally hundreds of places in Hong Kong to get a China Visa and as far as I can tell, being in Hong Kong is by far and away the easiest and best way to get your visa for China, outside your home country, which as global nomads we are scarcely in. How to get a Chinese Visa easily! Get it in Hong Kong! I recommend it – they have a lot of branches but believe me just turn up in Tsim Sha Tsui or Mong Kok and wander round the streets and you will see a place doing China Visas. – They will ask for entrance point – always put Shenzhen as that way they know you are crossing the border on foot – which you will do if you go HK – China. I’ve always put Shenzhen. Thousands of tourists and business travellers pass the Hong Kong to Shenzhen border every day. – They will ask for for expected date of travel – just make this up if you don’t know when you are heading – you will have three months (I think) from the date printed on the visa to enter. No big deal this question. – There is a section for hotel/where you are staying. I normally just write a hotel name in the city I’m visiting on that trip, or write – staying with friends. On none of my 4 recent trips have I actually stayed in the place I wrote on the form. They never check. If they do then you will need to book a hostel or hotel online and print it to show them (I’ve never heard of this actually happening though). – Do you have Medical Insurance? Just write ‘No’ in the box. Trust me! 5. Attend in person to hand in the form and voila!! You also have the option of collecting it in a rush in ONE working day (for an extra cost), 2-3 working days (extra cost) or just what I do – regular 4 – 7 working days (the normal price). SO there you have it folks! It’s easy to get a China Visa in Hong Kong. What are you waiting for? Get out there and see it!! China is an amazing country and to be honest it’s one you should never neglect. I’ve been 6 times and counting! Here’s 3 top photo highlights so far to get you in the mood to do China!! Enjoy China! Don’t Stop Living! This entry was posted in Asia, China, Destinations, Hong Kong, Visas and tagged China, China Travel Service, China Visa, Chungking Mansions, HONG KONG, Lok Ma Chau, Mong Kok, Tsim Sha Tsui. Bookmark the permalink. This is really useful. We made a few mistakes with our application. First off, we did say we had health insurance. Also, the regulations have become more strict since September 1 where you have to provide proof of an onward ticket along with a hotel reservation in your application. The agent isn’t so sure we’ll be both get a Visa because our hotel booking is only in my name (not in Audrey’s) and also we’ve booked our first night in Guilin and not in Guangzhou where we’ll be arriving by train. I guess we’ll find out on Monday if it all works out; fingers crossed! Thanks for the advices, particularly for the insurance part. I’m Canadian and currently in HK. I will (try to) return to mainland for the third time, this time with a working visa…fingers crossed! I fund an employer, and he’s ready to hire me, everything on his end is done. But when I tried to apply to the Chinese embassy in HK, they told me his working certificate mentions that I can apply from canada, not HK, which would require me to head back with.a 2000$ ticket… So now I’m waiting while my employer is redoing the process so that the certificate mentions “Hong Kong”. The process – his part – will work but I doubt this will work in HK as I was told china is making working visa requests harder year by year. Can I have your advice on something: I also heard that agencies in HK can actually do it for me in Canada. That would imply I send my passport by secure mail to canada, they would apply in my behalf – letter of consent, etc – and reship my passport. Do you know and/or trust this way? Thanks for your quick reply. I will then wait and hope for the best. Your comments are reassuring. Will see and will keep you updated. What I wouldnt give to have a debate with you about this. You just say so many things that come from nowhere that Im fairly certain Id have a fair shot. Your blog is terrific visually, I mean people wont be bored. But others who can see past the videos and the layout wont be so impressed together with your generic understanding of this topic.